1 Set the oven to 180C fan, and grease and flour a 20cm cake tin. 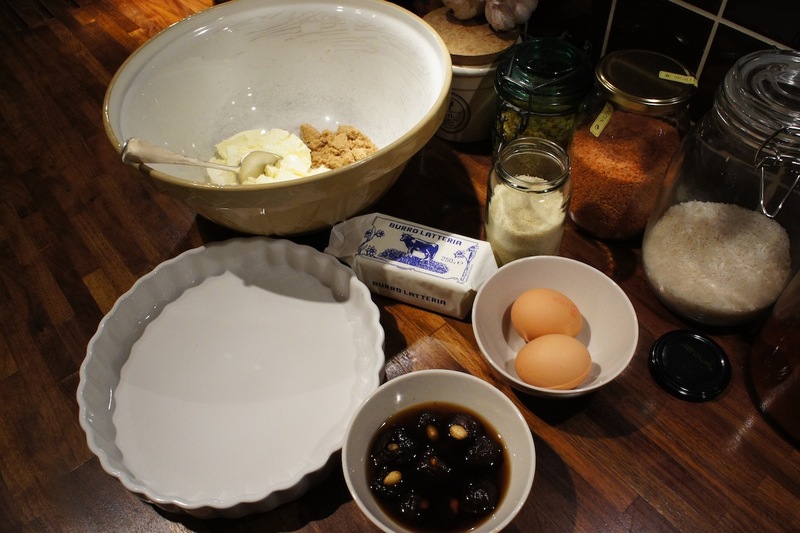 2 Make the crumble by putting all the ingredients, except the flaked almonds, in a bowl and rubbing with your fingertips until the texture of breadcrumbs. Put aside. 3 Slice the rhubarb into 1cm chunks, put in a wide bowl or on a plate and sprinkle over the sugar. Put aside. 6 Sift the flour into the wet mixture, then add the ground almonds and gently combine with a metal spoon. If it feels a little stiff, add a few drops of milk – and I mean drops! It should be a reluctant dropping consistency. 7 Scrape the batter into the cake tin and smooth the top. Pile the rhubarb on top of the batter, making sure it’s covered evenly, then sprinkle the crumble topping over the rhubarb, again making sure it’s evenly covered. 8 Put in the oven for about 35 minutes, then scatter the flaked almonds over the top and put back in the oven for another 15 minutes, or until a skewer comes out of the centre of the cake clean. 9 Cool the cake completely before removing from the tin. 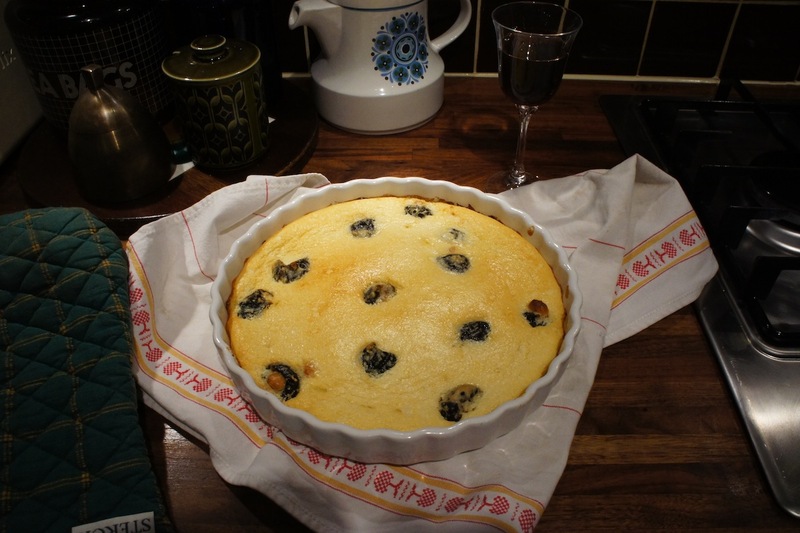 In fact, this is a great cake to make ahead of time, as it’s even better the day after baking. Unbelievably, it has been nearly three years since I packed away my London flat, stacked up all my boxes in a storage unit in Brighton and strode off into the Turkish sunset. The sunset scenario didn’t exactly work out, and it’s taken me a while to find my feet again, but finally, I’m back on solid ground, in a lovely flat, with a lovely flatmate, and most excitingly, have all my wonderful kitchen things out of storage and back in their rightful place – in the kitchen. I’ve been thinking about my blog and how to restart it for a long time now, and have made a few attempts at getting it going again. I’m not sure why, when I have such a great kitchen to cook in now, I’ve been feeling so blocked when it came to writing about my food again. But I’ve decided that, rather than making a big song and dance about it, I’m just going to slide gently back into the blogosphere and hope that a few people join me along the way. Now, take that look off your face. They’re not just what your granny eats to keep herself regular, okay? I admit that in my childhood they had all the allure of a dose of Benylin. 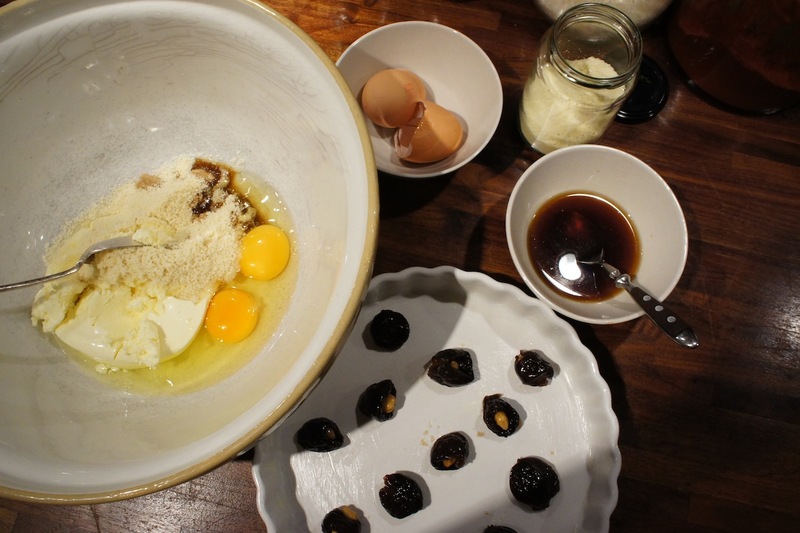 But, due to the current popularity of Middle Eastern and north African food (thanks, Moro and Ottolenghi), prunes are fast becoming a store-cupboard staple in my home. In fact, the reason I had a rather large tub of them in my fridge was because I’d used them in an Ottolenghi recipe for osso bucco with prunes and leeks. 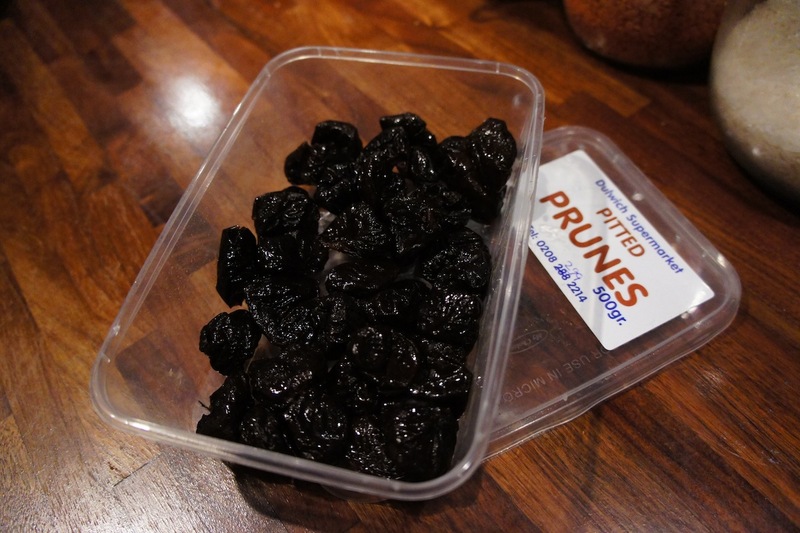 And the only prunes I had been able to find locally were in mahoosive quantities. Ooh, I’m not sure about that, I thought. No, of course I didn’t. I thought, bloody hell, that sounds fantastic! And even better, the recipe Zoe suggested was gluten-free, which meant it would also perfectly suit my sensitively stomached flatmate. 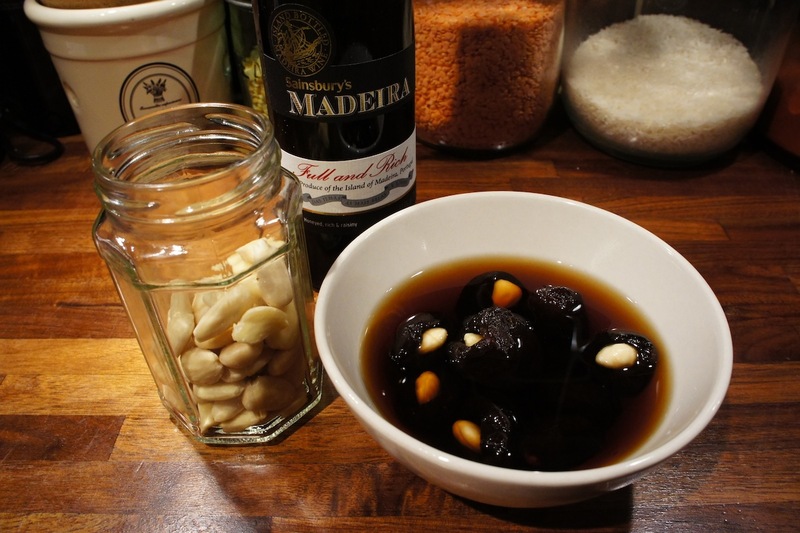 Zoe had said she generally used Armagnac or Marsala for the soaking, but I chose Madeira (mainly because it was the only one I could find in relatively small and cheap bottles). And I think you could probably use any sort of strong-ish alcohol that takes your fancy. 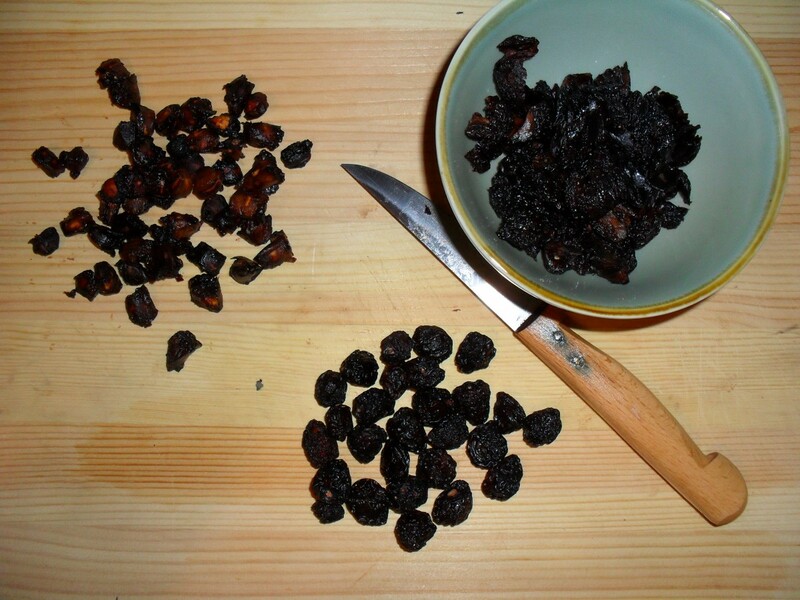 So, put a whole blanched almond inside about 12 pitted prunes, stick them in a bowl and soak them in your booze of choice overnight. Butter a baking dish. (The one I used here was, in fact, a little too wide and shallow. For these quantities, I’d suggest something about 20cm wide.) Then place the boozy prunes in the dish. Serve immediately out of the oven. In fact, just pick up a spoon and dive in. I’d say this should be enough for four – four very restrained people. In reality, Flatmate and I managed to scoff pretty much the lot in one sitting. As it should be done. Being a predominantly Muslim country, Turkey doesn’t have a great deal of pork available. And I do love my pork. So when I’m back in France or England, I tend to eat a lot of it. After all, there really is nothing like a deliciously spiced saucisson in France, or a plate of crispy bacon in Britain. My stay in London has been quite long this time, and I realised today that it’s only two weeks until I head back to Istanbul. Which, of course, I’m really excited about – but, what was the first thing I thought when I realised my UK trip was close to an end? Pork! So, today, when I said I’d cook Sunday lunch for Lene, my London host (landlady? ), and her family, I knew exactly what was going to be on the menu. Lene is as much into her cooking as I am, and has a fine collection of cookery books. Including a lovely set of Elizabeth David classics. 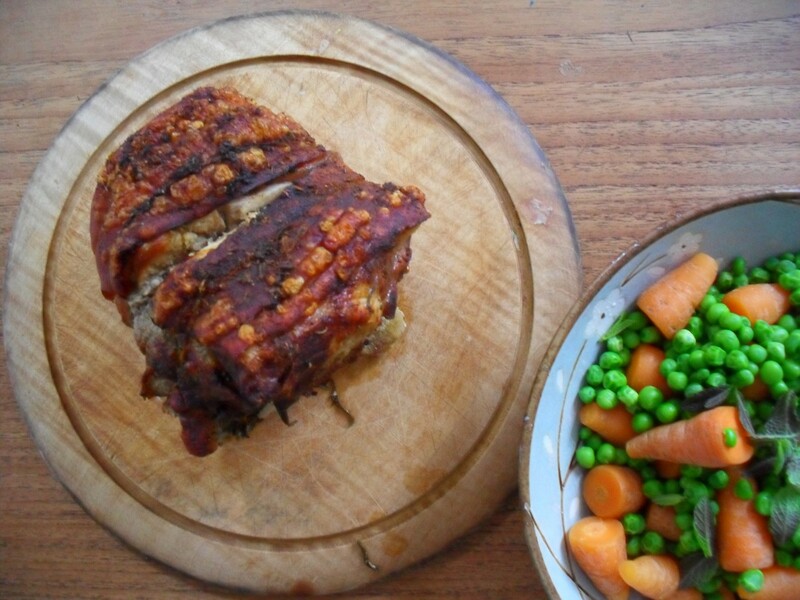 Among which I found a recipe for roast pork with fennel – in her book called Italian Food. But, of course, being a bit of a food fiddler, I couldn’t just leave it at that, and decided to add garlic, rosemary and paprika to the rolled shoulder stuffing. 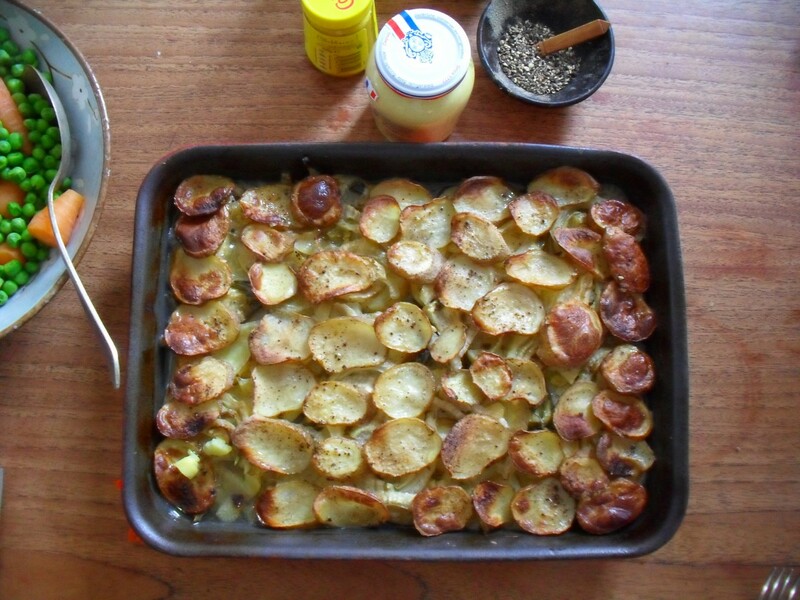 On the side, I kept to the fennel theme, and made a fennel and potato bake. 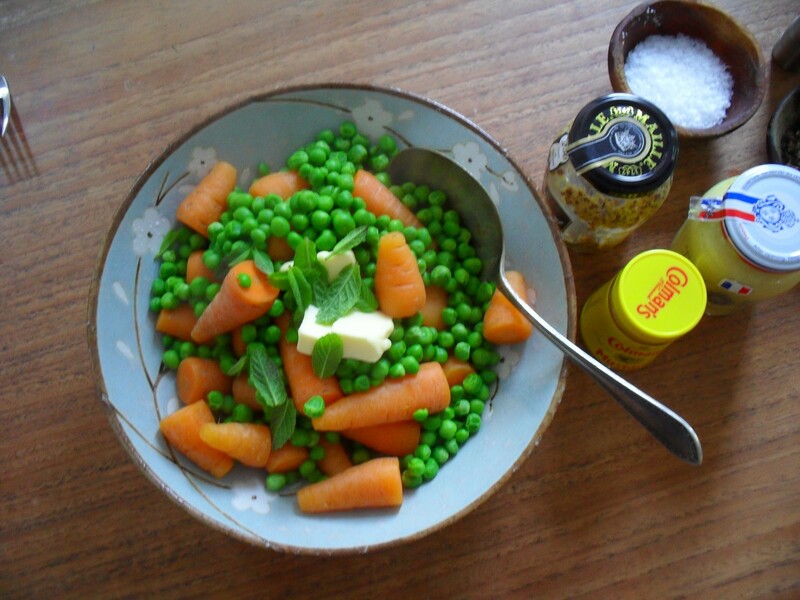 And for some extra veggie-ness, some simple steamed chantenay carrots and English peas – with plenty of mint and butter, of course. And for pud? 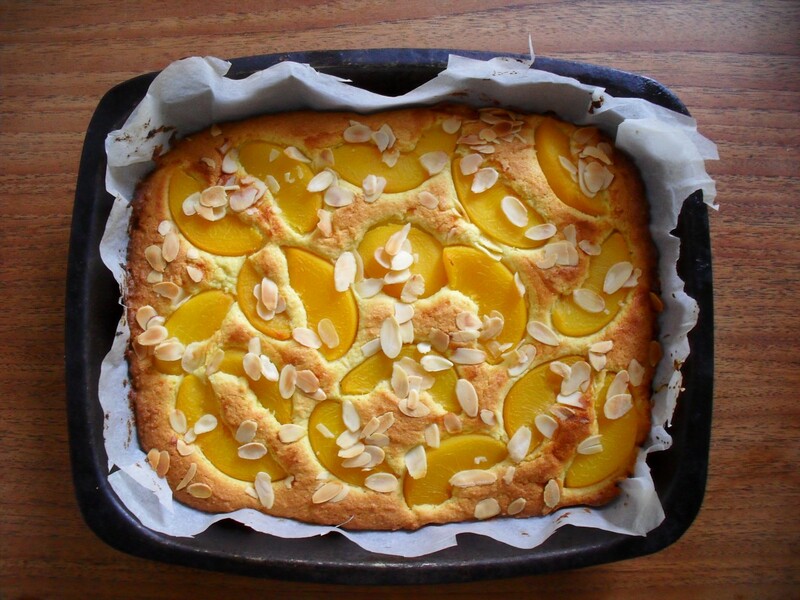 One of my faves – Dan Lepard’s saffron peach cake, with loads of thick whipped cream. 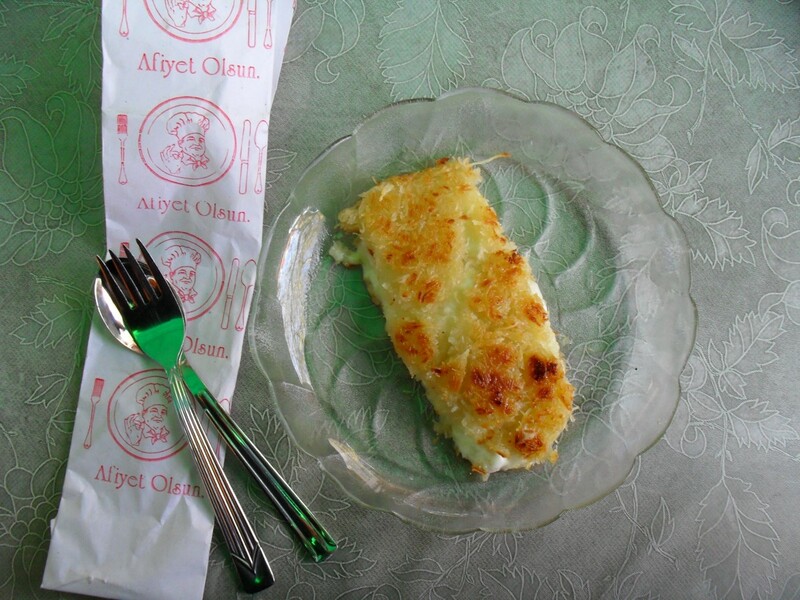 Every region of Turkey has its signature dishes, and one of Antakya’s tastiest is künefe, a pudding of a kind of vermicelli with soft cheese sandwiched in the middle. The whole thing is griddled to a crispy golden colour and doused in sugar syrup. It is, quite simply, delicious. 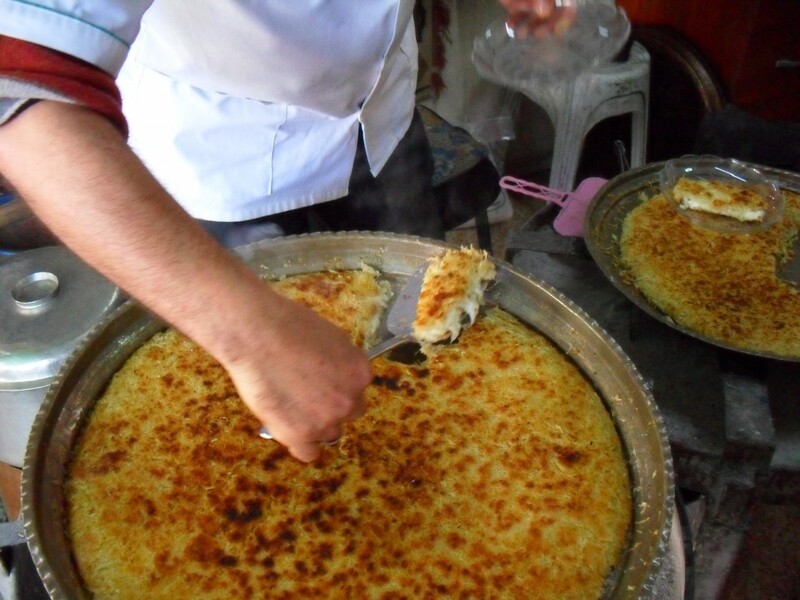 If you want good künefe in Antakya, the only place to go is Yusuf Usta’s shop Çinar Alti, nestled in a small square off the old city’s bazaar area. By the time I visited him last week, I’d already had the chance to try künefe in two or three other places, so was feeling fairly confident in my abilities to judge a good one. 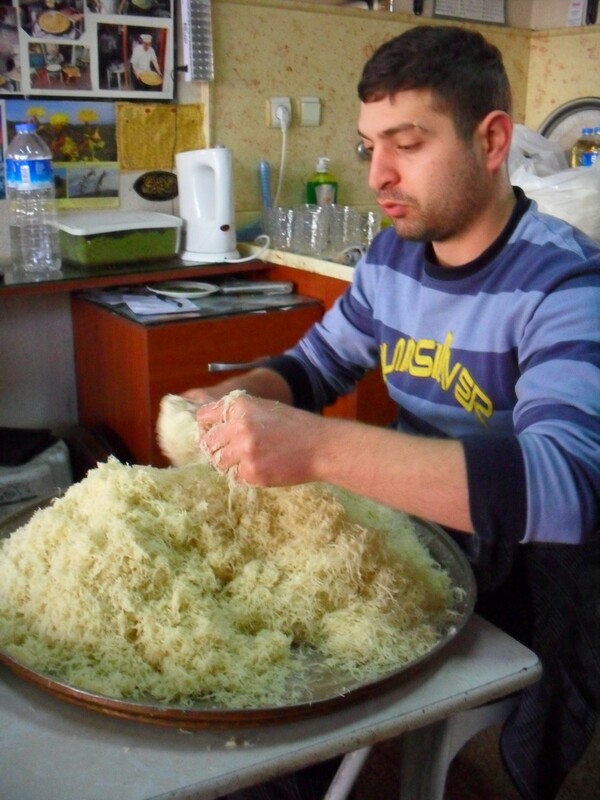 But before I could taste Yusuf Usta’s künefe, I was treated to a demonstration of exactly how it’s made. 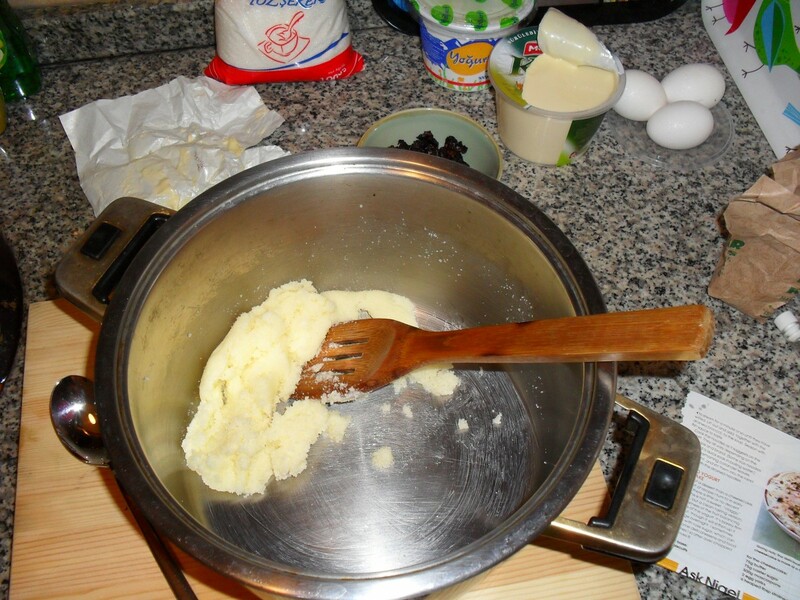 First, flour and butter is rubbed together until tiny lengths of dough are formed. This takes quite some time, so Yusuf Usta sensibly leaves this arduous task to his assistant. The spaghetti-like dough is packed loosely into the base of a large copper tray, which is then covered with a soft, somewhat tasteless cheese, crumbled evenly to cover the bottom layer of dough. Another layer of dough covers the cheese, and the whole shebang is placed over a very hot charcoal fire. 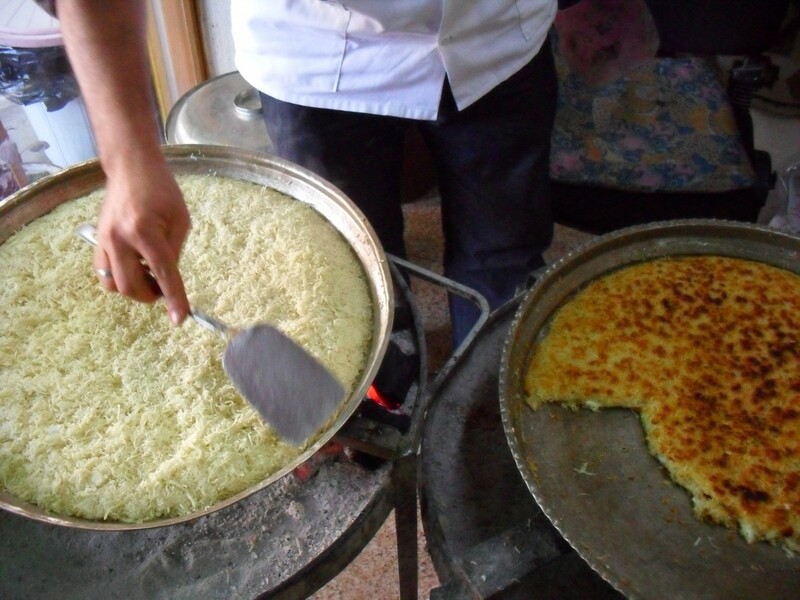 It takes about ten minutes for the künefe to become golden brown and the cheese to start to meld into the mixture. 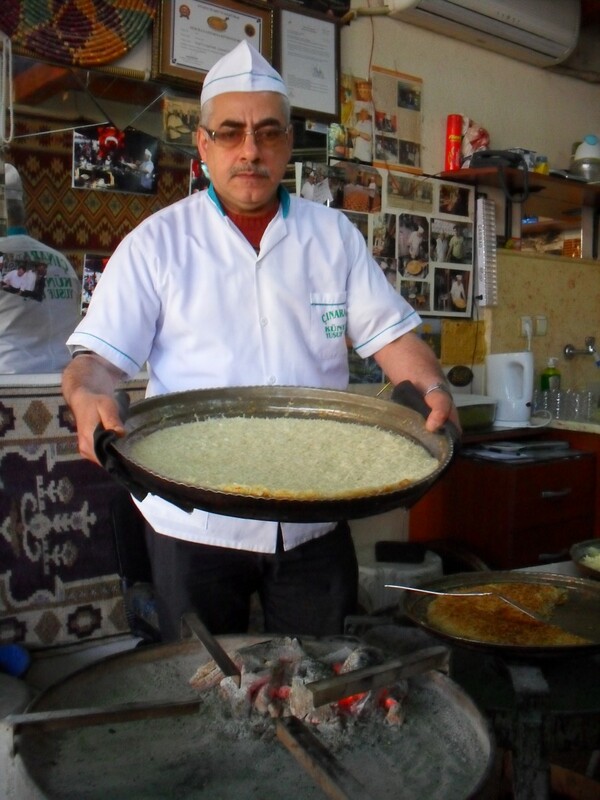 When the first side of the künefe is ready, Yusuf Usta shows his true skill and tosses the large dish to cook the other side. 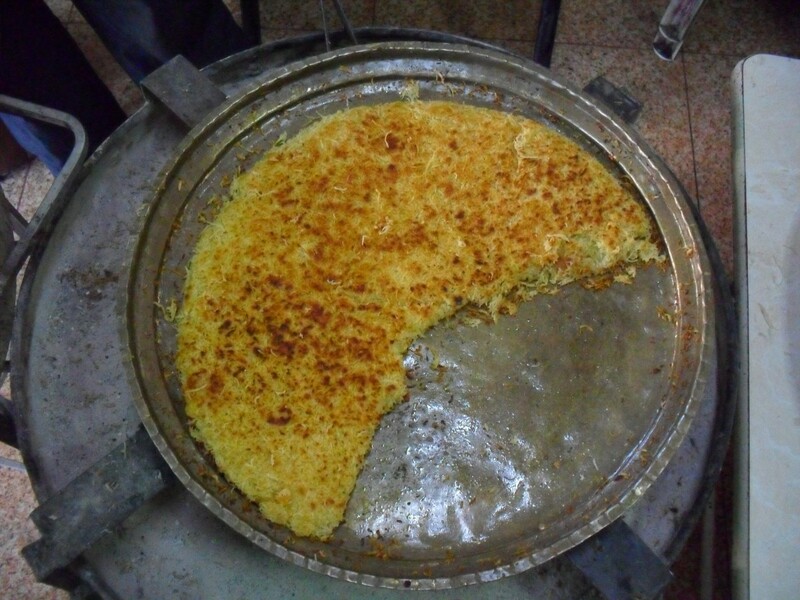 Another ten minutes to crisp up the other side, and the künefe is ready to eat. By this point, my mouth was seriously watering, and I couldn’t wait to try the tasty-looking concoction that had formed in front of me. 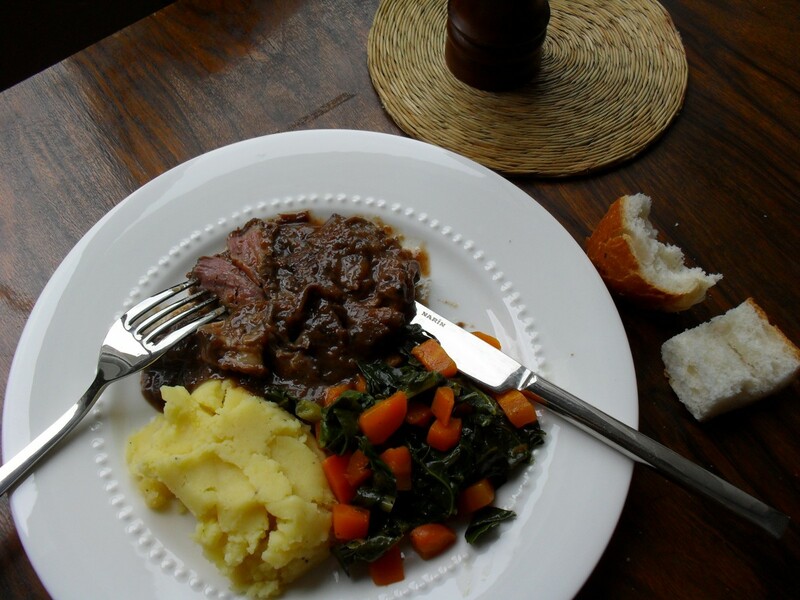 The finishing touch is a couple of spoonfuls of sugar syrup that simmers away in a large pot. 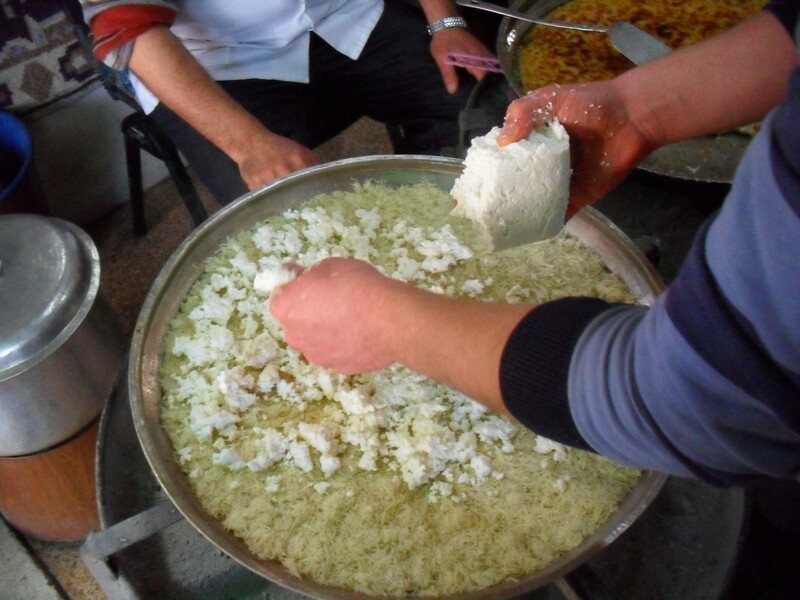 I bit into the crispy künefe and as the hot, soft cheese and syrupy sweetness hit home, I can honestly say I was in heaven. 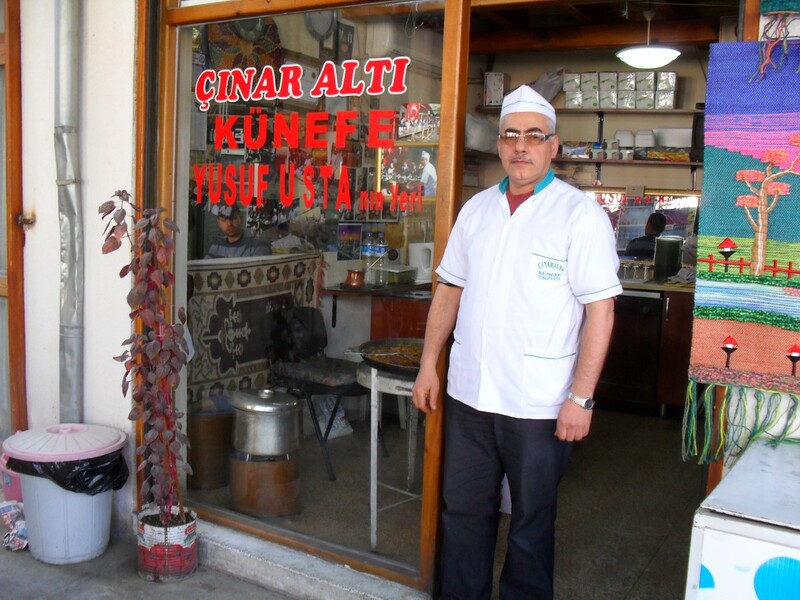 Yes, it was true – Yusuf Usta is the king of künefe. Last weekend, our friends Meryem and Özgür came to our flat in Istanbul’s historic area of Sultanahmet to experience a great British tradition – the Sunday lunch. Although tasked with cooking them something typical, it was clear a roast was not an option, as an oven doesn’t look like it’s going to make an appearance in our flat any time soon (just saying the word ‘oven’ makes me pine for roast chicken, roast potatoes, apple crumble… *sigh*). And, when I started flipping through all my favourite recipes, I was surprised to see just how many homegrown dishes did actually involve a good roasting. Conveniently, some homemade hummus was given to me that very morning by my friend Mireille (who has a minor obsession with chickpeas, in which I am happy to share at every opportunity), which I decided to serve as a starter – not exactly British, but delicious nonetheless, and that’s really all that counts at my table. Roasts aside, another great British staple that regularly pops up in my cookbooks is a good old stew. And, being in the land of the lamb, I plumped for braised lamb shanks (which I was very proud of asking for in Turkish – and the butcher understood me!). So, I rolled the lamb in seasoned flour and browned it in hot olive oil, removed to a plate, then softened some onion, garlic and carrots in the same oil. I added a good pinch of dried rosemary (unfortunately, I’m finding it hard to get the fresh stuff) and a couple of bay leaves, put the shanks back in, then added about half a bottle of red wine, a good glug of Balsamic vinegar and topped it up with stock until it covered all the meat. Then I turned down the heat and let it simmer and bubble away for about three hours. After this length of time, the sauce was beautifully dark, full-flavoured – and, I’m afraid, a bit twiggy from all the dried rosemary. Usually, I’m all for the short-cuts in cooking, and normally would have left the sauce a bit chunky with the onions and carrots. But as this was the first time I was cooking for Meryem and Özgür, I didn’t want them to go home with the memory of nothing but mouthfuls of dried herbs. So, once the meat was falling off the bone and the sauce suitably reduced, I removed the lamb once again, and strained the sauce, pushing the soft onions, garlic and carrot through a seive to get all the flavour. By this point it was looking a little too thick, so I simply added a bit more water, checked the seasoning, then threw all that lovely soft meat back in the pan, and kept it on a low simmer until we were ready to eat. I knew the only thing to serve on the side of a saucy dish like this was mashed potatoes, so, to everyone’s delight, that’s exactly what I did. I’d also bought some amazing-looking greens at the market last week, so quickly cooked those down in some olive oil with some more softened carrots and a sprinkling of fennel seeds. Now all I had to do was conjure up a pudding. And what a treat I came up with. Again, it was a random flick through my cut-out recipes that inspired me. Remembering the five or six rapidly softening lemons in my fridge, when I came across a recipe for lemon posset, I knew I’d found my pudding destiny. With just three ingredients – double cream, sugar and lemon juice – posset is such an easy-to-make classic British pud, but I’ve never attempted it before. Although I knew immediately that I’d have to use some ingenuity with it, as double cream is pretty much non-existent here. What there is though, is kaymak, that wonderful clotted-cream-alike that’s eaten at breakfast, smothered on bread and dripping with honey. So, I simply replaced the cream with kaymak, set the ingredients on to boil and crossed my fingers that it would all come together. Luckily, all that was needed was to pour the cooked mixture through a tea strainer to get rid of some slight graininess, and it set beautifully. 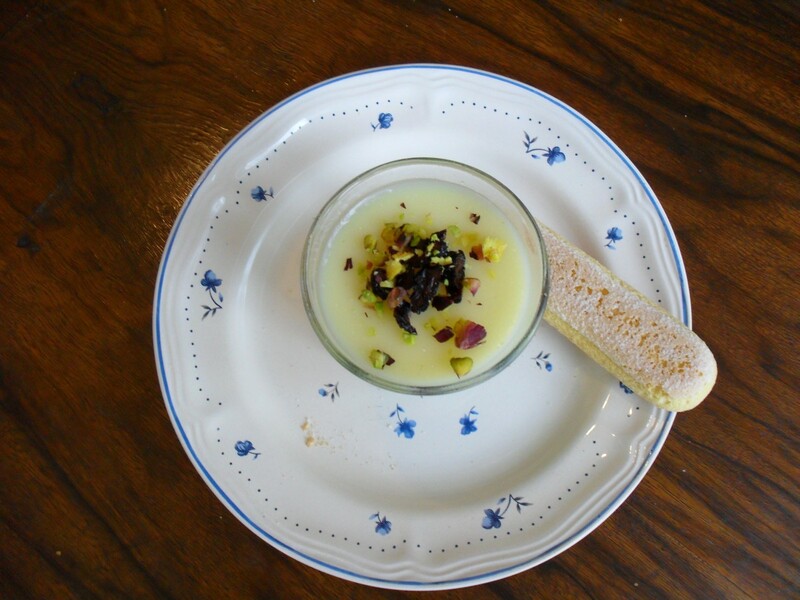 I decorated each posset pot with a little chopped dried cherry and pistachio nut that I had leftover from last week’s cheesecake, put a sponge finger on the plate alongside it, and a very smart-looking pudding was served up. So, despite using some very un-British ingredients, I was quite amazed at how all the elements came together to create something that tasted, to me, pretty traditional. 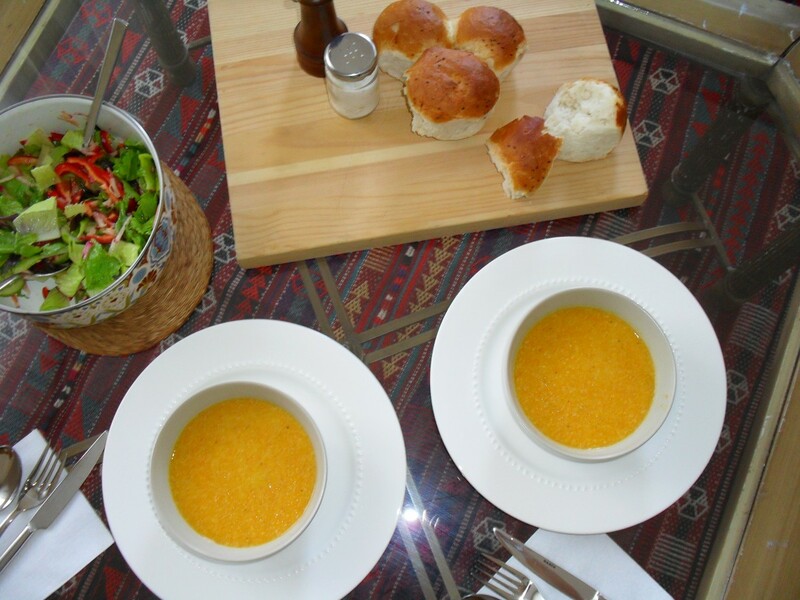 And hopefully, in the process, I managed to give Meryem and Özgür a taste of my “home” cooking – in more ways than one. 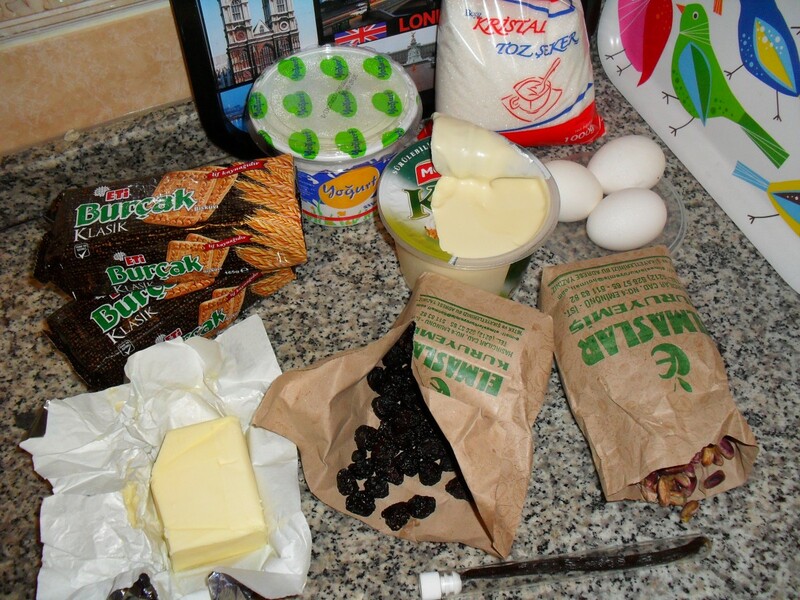 Yesterday saw my first attempt at making a cake here in Istanbul. 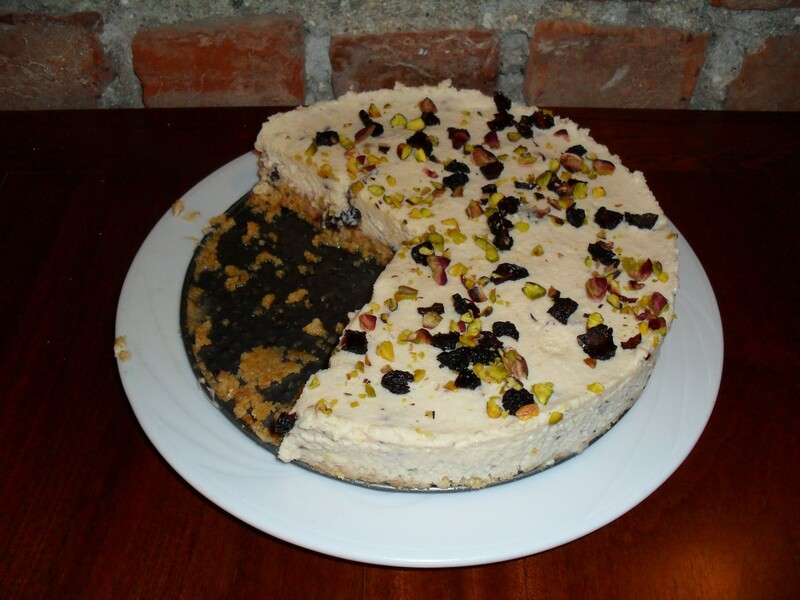 Although, as I have no oven, it was a no-bake cake – a no-bake pistachio and dried cherry cheesecake. In fact, it ended up being a no-bake, no-scales, no-cream cheese, no-mixing bowl, no-electric beater pistachio and dried cherry cheesecake. The adventure started when I tried to find cream cheese. 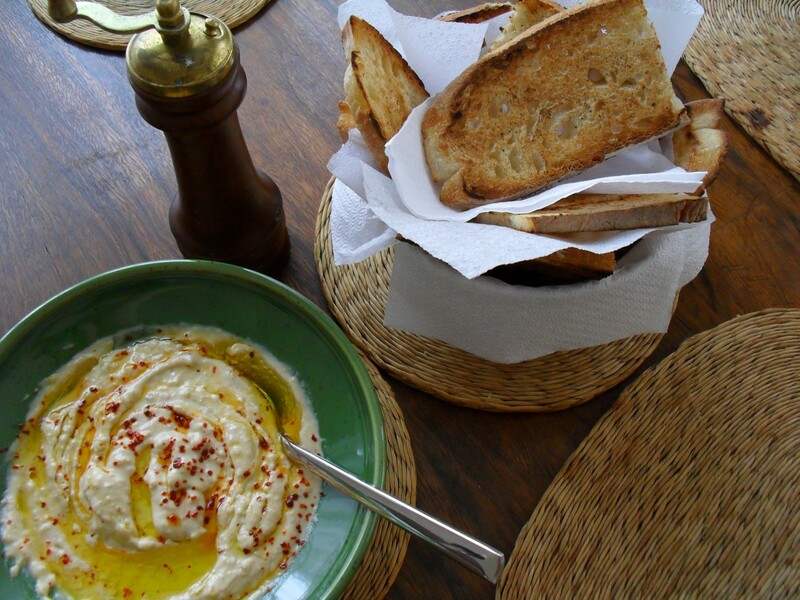 The recipe I used, a favourite of mine by Nigel Slater, actually calls for mascarpone – but I knew that would be a fruitless search in Istanbul, so thought cream cheese would be an easier option. How wrong I was. If there is such a thing as cream cheese in Turkey, I have yet to find it. It was suggested I use something called ‘krem peynir’, which, literally translated, does actually mean cream cheese. The guy in the shop promised me it was “without salt”, so I took my chances. Unfortunately, once I got it home and opened the pot, I discovered it had the taste and consistency of flavourless Dairy Lea. An hour later, with fingers the colour of Sweeney Todd’s, I started on the actual cheesecake. First step, cream the butter and sugar. Not as easy as it sounds when you have no mixing bowl, no electric beater and no scales to measure the quantities. What I did have was a large saucepan, a wooden slatted spatula and an extensive conversion chart to work out how many dessertspoons of sugar make up 75g. What I want to tell you is that it had the consistency of a handkerchief during a heavy cold. However, I’m a lady, so I won’t. (But it did…) Once again, an electric beater would have come in handy at this stage. But I tried my best, than gave up and chucked in the rest of the ingredients. 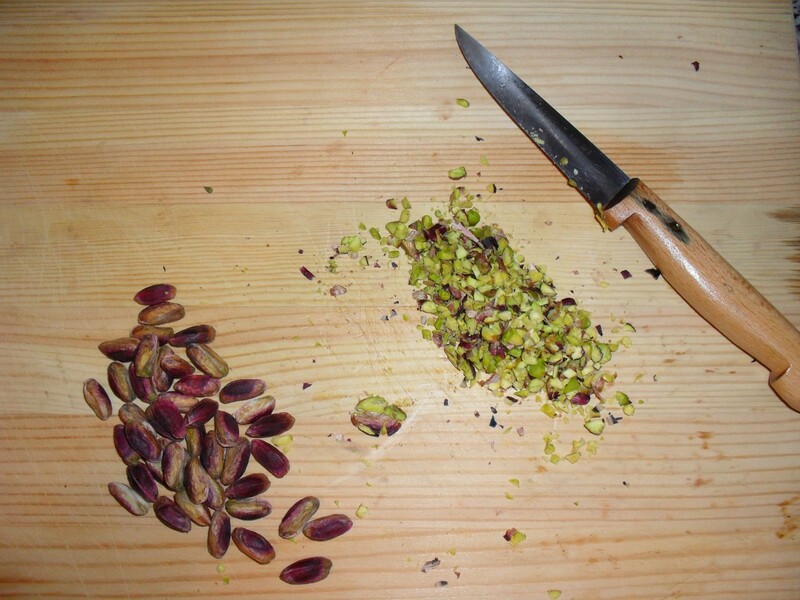 Including the pistachios – which were supposed to be finely ground, but my knife skills weren’t quite up to that job, so roughly chopped had to do. With all the ingredients (kind of) combined, it was clear that the consistency wasn’t quite right. It looked a little runny and more than a little grainy. But I poured it on top of the biscuit base, put it in the fridge and hoped for the best. This morning, I cautiously opened the fridge, and was amazed to see a well-set pistachio and dried cherry cheesecake. It was still definitely too grainy for my liking, but a couple of slices later, and the general consensus was that it was good. Unfortunately, due to Süleyman’s working hours, we don’t get to eat together in the evenings very often. So, although we’ve been having fabulous breakfasts and hearty salad-filled lunches, yesterday, it was great to have the opportunity to cook something a bit more elaborate for someone. That someone was my friend Mireille, who brought her delightful little one-year-old son Cebriel over to my flat in the afternoon. The afternoon drifted into the early evening, when I rustled up a light meal for us all. That morning, I’d realised I had some very soft-looking peaches and apples in the fridge, and decided I needed to do something with them quick, or they’d end up in the bin (a complete anathema to me, as I’m sure you’re well aware). 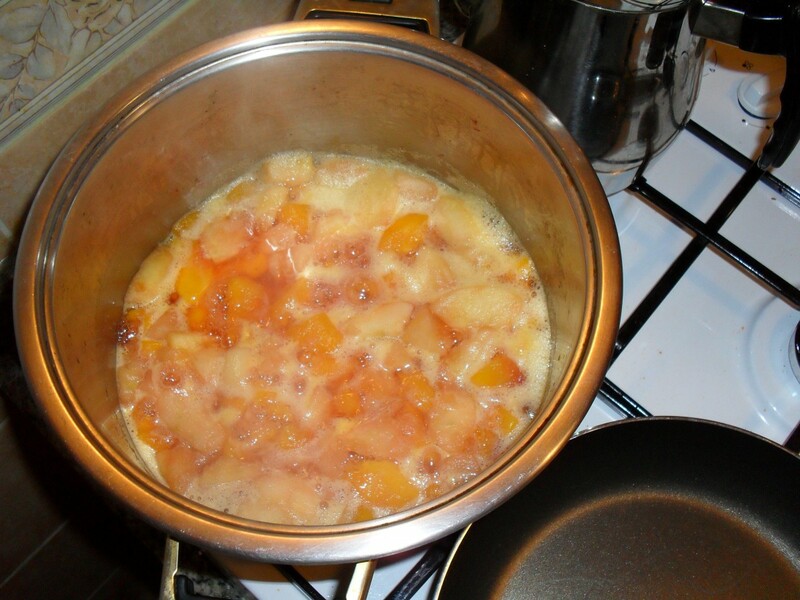 I am without oven at the moment, so had to cook the fruit on the top of the cooker – and, it struck me, the perfect thing to do with them was to make a compote. The Turkish word for compote is ‘komposto’, which rather sounds like something you throw on your vegetable patch – but luckily, the compote I made was far too good for that! I simmered the peeled, cored and chopped fruit in a syrup of water, lemon juice and sugar, until the peaches and apples were deliciously falling apart. Then I just left the sweet, slightly tart mixture to cool. Although the weather isn’t anywhere near as hot and humid as it was when I first arrived, it’s still fairly baking – not weather you’d immediately associate with bowls of steaming soup. But, spotting a full bag of carrots at the bottom of the fridge, I knew that was exactly what I fancied eating yesterday. 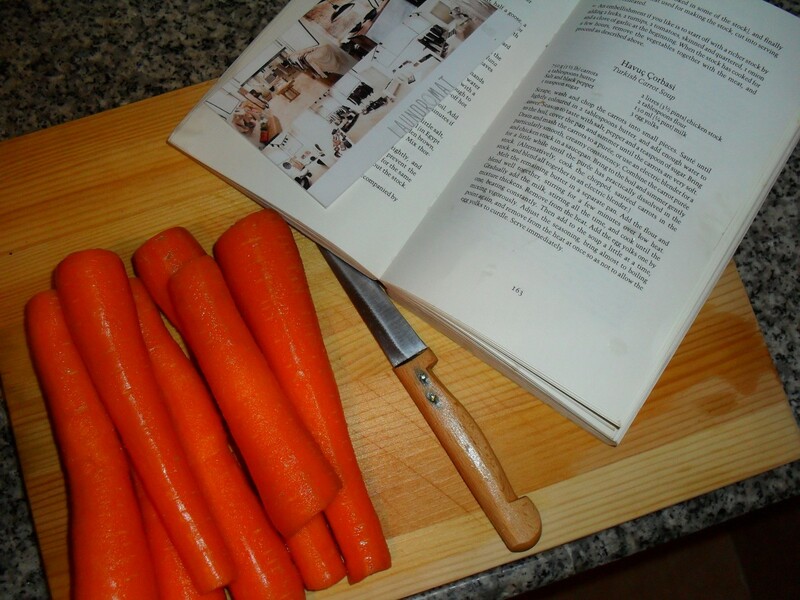 And, with perfect serendipity, I found in one of the few cookery books I managed to drag over to Istanbul (Claudia Roden’s A New Book Of Middle Eastern Food, natch) a recipe for Turkish carrot soup, or havuç çorbasi. 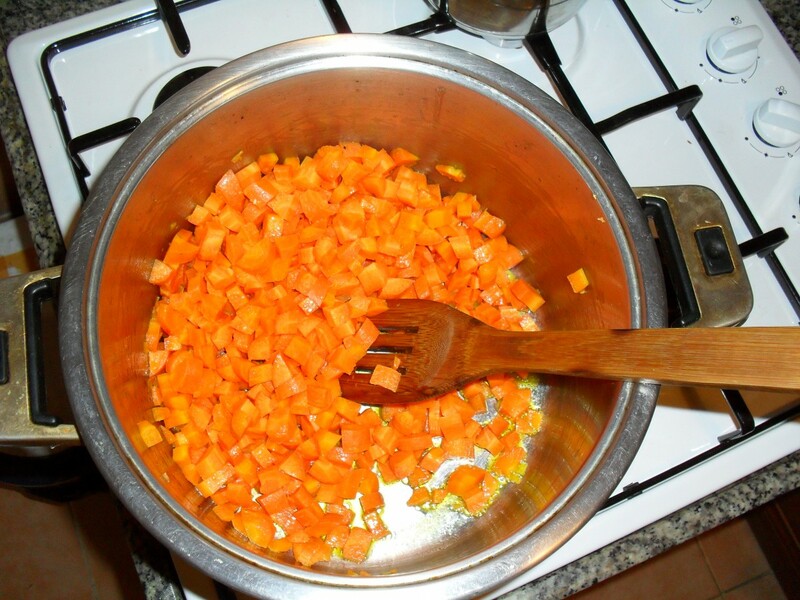 After softening the carrots in lots of butter, then simmering in stock until it all turns into a deliciously sweet purée, something rather special is added. After making a basic roux with butter, flour and milk, three egg yolks are added, making it a stunning yellow colour. Then, just before serving the soup, I stirred in the eggy roux, and served. This incredibly tasty soup manages to be rich and hearty, yet, thanks to the sweetness of the carrots, really quite refreshing for a hot summer’s evening. I’m sure it’s going to be one of my future favourites. 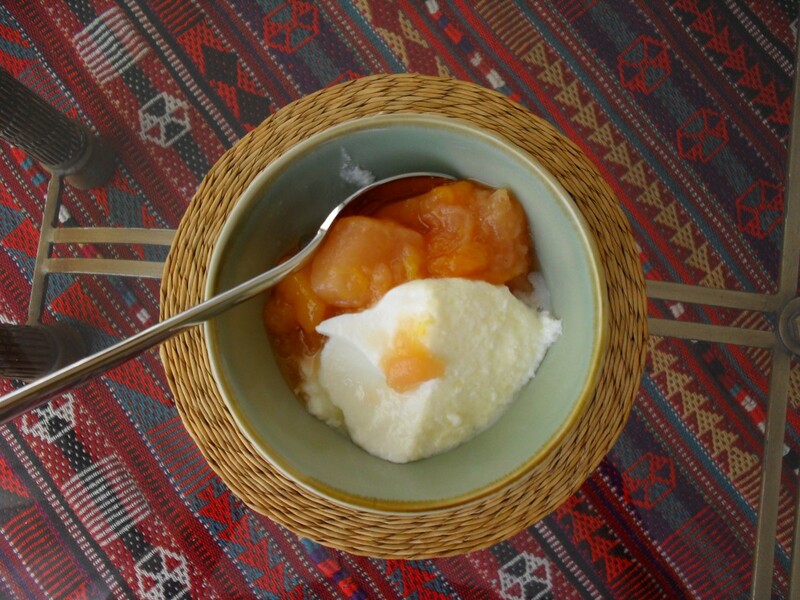 For pudding, we had spoonfuls of chilled compote alongside Turkish yoghurt. Now, I think I’ve talked about this before, but Turkish yoghurt is something else. Even thicker, if it’s possible, than Greek yoghurt, it is perhaps a little more tangy. But the reason is has the edge for me is that it comes with a yummy skin on top. I know that’s something not to everyone’s taste, but, like the skin on rice pudding, you either love it or hate it. And I love it.